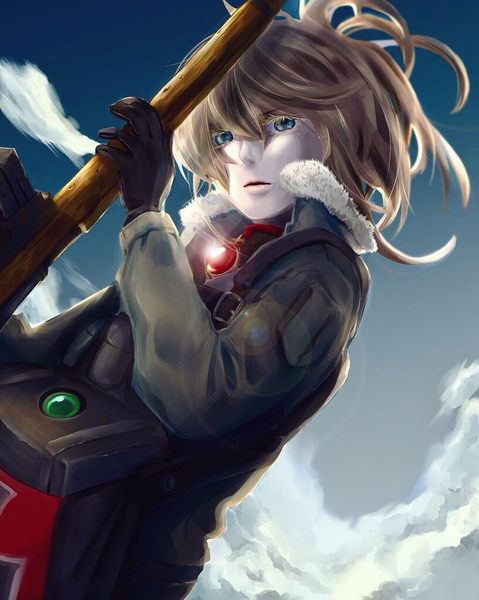 Today’s feature will be a co-op article by me (Cho) and Justus R. Stone, and the light novel we’ll be diving into is volume 1 of The Saga of Tanya the Evil. There will be spoilers in this feature, so it’s suggested you read volume 1 first. If you have though, please feel free to join in on the discussion! You can share your thoughts by leaving a comment below. 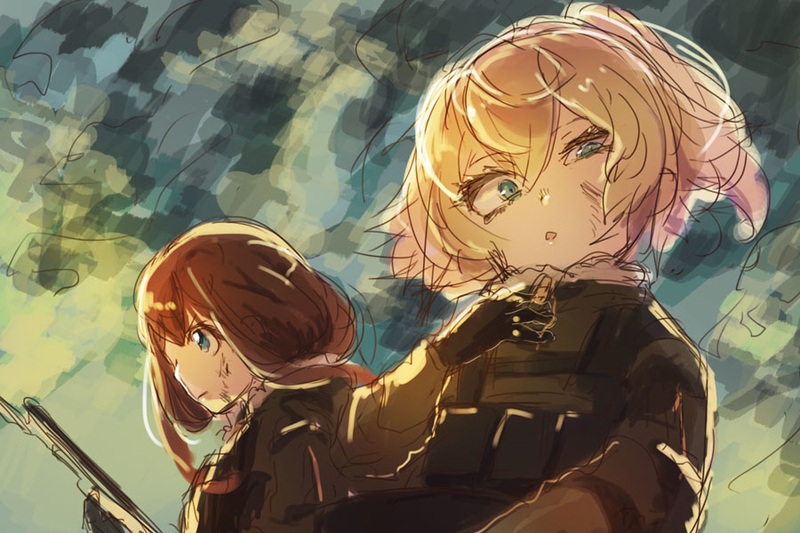 “[Tanya] is definitely a good commander, even if I’m not sure about her as a human being. Cho: As the book title implies, the story is all about a magical child soldier named Tanya (so technically this series is a mahou shoujo, I now realize). But is Tanya really the main character? Reading this first volume, the protagonist technically seems to be the HR director who died in modern-day Japan. Throughout the book, the “I” of the first-person viewpoint chapters is the nameless businessman, who refers to Tanya in third-person (e.g. “Tanya needs to make sure she does this,” or “Tanya was surprised by that”). In a way, it feels a lot like someone playing as some character in a video game, or something along those lines. Perhaps this is because the protagonist sees this new Tanya life as a game of ideologies to be won against Being X, the god responsible for his reincarnation. Things are made even more complicated when Tanya’s source of magical power, a device called a computation orb, becomes a means by which Being X apparently takes control over Tanya’s actions at critical moments. Why does this god keep interfering, exactly? If Tanya has to rely on Being X to survive the war, does that prove the protagonist’s pragmatism, or the necessity of faith in higher powers? Justus: I have no doubt our main character is said Japanese HR director. But you’re right, his manner of speaking about Tanya in the third person, but also making it clear he shares whatever fate awaits her, sometimes makes the narrative disorienting. The first time it happened in the book, I found myself doubting this was your typical isekai setup. The odder fact is he doesn’t always speak of Tanya’s experiences in the third person. Often, especially when Tanya is in a life-threatening situation, he does refer to her as “I.” In fact, most of those moments are when she is using the computation orb. As you noted, the orb was essentially hijacked by Being X to force Tanya to raise her voice in praise in order to use it. I have to wonder if part of the HR director’s presence in those moments is because it is specifically him Being X wants to punish. Otherwise, my take was the author was writing this as a character with dissociative identity disorder. This is an extreme condition in which two separate identities exist within, and alternately take control of, a single body. The exception to that diagnosis is HR Director seems fully aware of Tanya’s actions. I wonder how Tanya feels about HR Director. Does she view him and his actions in a detached way such as he views hers? I think there’s also an interesting point to be made about how this reincarnation starts. HR Director becomes self-aware as Tanya is being fed. Meaning, he hasn’t spent the entirety of her infant years conscious (as we see in many reincarnation isekais). So was his soul jammed into an existing person? Or was this the key moment where, for whatever reason, his awareness of his previous self was activated? Having that happen, perhaps he couldn’t help but see Tanya as separate. After all, she’d grown to that point without his influence or awareness. Maybe it was that realization that made him snap in a way and view her as being capable of functioning without him. Or, perhaps this was further meddling of Being X. After all, it seems the point of this reincarnation was to teach HR Director a lesson. Hard for that to happen if Director-san loses all his memories and just lives life as Tanya. And Who is This God Person Anyway? Cho: Perhaps the most interesting subplot of this volume to me was the conflict between the protagonist and Being X, though I do have some mixed feelings toward the setup. The entity who proclaims to be God is a curious individual who speaks of enlightenment and utilizes reincarnation, but is also apparently responsible for the Ten Commandments. There also appears to be other gods or godlike beings in this story, and amusingly they hold businesslike meetings that are just as beleaguered as those held by humans. But what is Being X trying to do with Tanya, exactly? It feels like the god wishes to see if he can reform someone like the businessman protagonist, and in the process work out what can be done about the unbelieving modern world he comes from. I have to wonder if giving Tanya great magical power will really help his case though, especially when it sounds like Tanya’s troop will be at the very center of significant battles in a war being waged across a whole continent. It feels a lot like this god is willing to let a whole lot of people die just to try proving a point. But now that I think about it, I suppose our protagonist isn’t so different. Between Tanya and Being X, which is the lesser of two evils? Justus: Of all the isekais I’ve read, this is interestingly the first one where a god figure is openly hostile to the MC and forces this reincarnation as a means of punishment. Typically this setup is a means of apology, for a premature or accidental death. In this case MC’s death was premature, but he apparently caught god on a bad day. Being X struck me as the negative aspects of the Christian god taken to extremes. For instance, the notion that redemption is only possible through worship. Being X seems put out because he doesn’t get worshiped properly. Indeed, he is harsh on MC for being an atheist. I found this version of god to be petty. Even as MC tries to explain the world has changed so much, without any update in terms from god, Being X just dismisses him. Being X seems to think if something happened two thousand years ago, people should still be operating in the same manner. Then, as MC (as Tanya) becomes accustomed to his world, Being X and his cohorts further interfere with the computation orb. In that sense, Being X isn’t content with just sending MC to this world heading toward war, he wants to make sure MC is learning the specific lessons Being X wants. In the way Being X wants. I think back to how God is presented in different ways between the Old and New Testaments in the Bible. Old Testament God is all about the fire, turning people to salt, drowning the world. But then New Testament God is all about love. Perhaps the author, by showing more than one divine being, is suggesting these weren’t two aspects of the same God, but separate entities. It would explain Being X being all about the wrath and wrapped up in commandments handed down thousands of years before. I also wondered, did Being X contrive this world/situation for Tanya’s benefit? I mean, if you read HR’s arguments to Being X, he says he lived in a world of science and peace. He cites those as being major contributing factors to his lack of faith and increased self-interest. This world, with its magic and impending war, seems a little too perfectly tailored to teaching the lessons Being X wishes. Though I suppose that argument doesn’t hold much weight seeing as how we have those future flashes of the reporter. But still, it makes you wonder what other worlds Being X has access to and if he’s sent others to those worlds as punishment for similar transgressions? Also, Do We Really Need a World War? Cho: I personally quite like the idea of nations all getting along and not waging war, but I imagine Tanya would just call me a fool for entertaining such a naive notion. The history in Tanya’s world appears quite similar to the history in ours, and in the early 20th century the various nations of Europe were poised for some of the most devastating conflicts the world had ever suffered. Thanks to weapons such as tanks, airplanes, submarines, machine guns, land mines, poison gas, and long-range artillery, World War I turned out much worse and lasted much longer than a lot of people expected, and it looks like things are set to play out in a similar manner in Tanya’s world (though with the addition of magic-wielding troops, because why not). The setup for the war in Tanya’s world seems a bit different though. In this case, The Empire just seems to be the place that the rest of Europe hates (because it is a growing threat, I suppose), so each country is going to take turns invading the place. Can the various political leaders of the world please just work something out, before Tanya and her higher-ups start taking drastic action in retaliation? I suppose we wouldn’t have 8+ more volumes then though, and Tanya would have to find some other job to excel in. 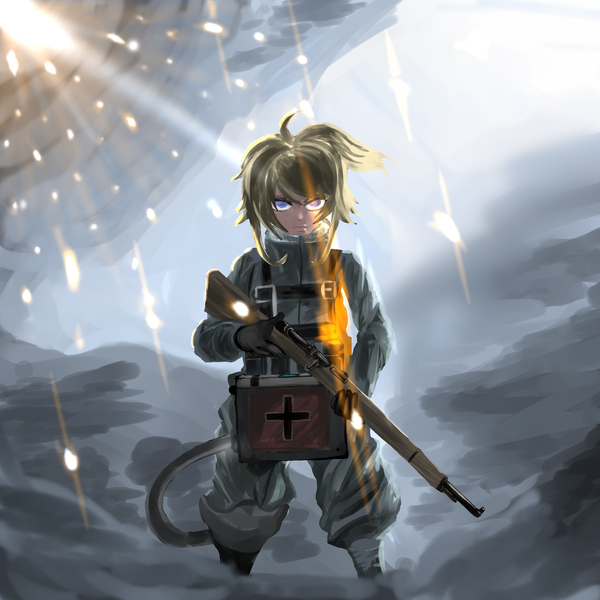 Interestingly, Tanya does wish to get away from the dangers of the battlefield, but also says there’s no other line of work that’s suited for her. Does our protagonist like war or not? Perhaps we can simply say Tanya likes the organization of an army with its clear chain of command and straightforward work flow, but wishes she didn’t have to risk her life in order to rise up the ranks. Justus: I think Tanya’s statements about the military are of a more pragmatic manner. She recognizes she has talent, and those talents are uniquely tailored for warfare. If I recall, she laments the fact she is on the front lines because of the danger, but she also accepts it is the fastest way to obtain glory and therefore advancement. Again, I think Being X means for our MC to be front and center for the war, and that’s why Tanya is gifted for magic. It’s probably just an underestimation on Being X’s part that the personality of HR Director is also tailored for success under these conditions. In terms of the war itself, I think it has to do with the time this world occupies. As you said, it’s early 20th century, meaning no internet, no mass and rapid communications systems. Also, it seems the countries are still quite autonomous, without many trade treaties to encourage cooperation. It also seems the surrounding countries have their own internal instabilities. So the governments of those nations are using war to distract the public from their own failings and/or corruption. I’d say we still see those kind of conflicts in our modern world. In this case, the Empire is a double thorn for the surrounding nations. Not only is it getting stronger, it’s borders also grant it access to virtually all the other nations. While it’s a strategic nightmare for the Empire itself, I guess I understand the tactical advantage it would give another nation. But as I said earlier, perhaps war in this world is unavoidable because of Being X. Based off his statements to HR Director, he’s not all that enamored with humanity any longer. Perhaps he sees this as a double-fold opportunity. First, it teaches Tanya a lesson. Secondly, if she accomplishes great things with “the power of god” then it might serve to further convert the denizens of this world. Like I said, a petty god. On the topic of Tanya joining the Empire’s military: She didn’t have much of a choice. Skilled mages are a rare commodity in this world and the laws permitted children joining, or being conscripted, the military if their magic skills were powerful enough. Based on the glory and honor based militant patriotism ferver of WWI era Europe of Tanya didn’t volunteer she would have been conscripted like Victoria was. Tanya volunteered to avoid being a conscripted meatshield and to gain enough prestige to become a rearline officer. Thanks for the comment, Joker! I’m a bit curious how the military went about finding kids with magical aptitude in the first place. The novel didn’t go into magic much, other than explaining how soldiers in the army use devices called computational orbs in order to conduct magic spells (or formulas, as they termed them). At any rate, it’s a sad situation. Who’s driving Tania: There are 2 hints that I don’t think you gave enough importance: the fact that “Tanya” knew how to pray when the orb was being tested for the first time and about to blow up and the fact that “Tanya” has a worn cross that she didn’t remember getting. That hints at “Tanya” being there, but not in control. Maybe she feels more devotion to God because she feels possessed by the evil MC. Maybe the MC is there to drive the real Tanya into despair and religion! Twisted way of looking at it, but it did cross my mind while I was reading the book. Who is God: don’t really care to be honest. All that matters is that the Gods are depicted as walking the fine line between enlightening humans and in doing so risking being forgotten. I think it’s the author’s way of justifying the random acts of evil in the world… it’s just the way God sets humans back to the ways of believing. Those parts really felt more like the author thinking about his life than anything Tanya related. Regarding Tanya, I did feel that it was all a little odd how she didn’t seem like a different person at all from the PR director. Granted the memories from our protagonist’s past life remained intact, but I still imagine Tanya’s upbringing in an entirely different environment would have a bigger impact than it seemed to have. A case of the nature vs nurture debate seeming to lean almost entirely toward nature. I suppose it doesn’t help we pretty much don’t get Tanya’s opinion on anything outside of military business the entire book. And regarding WW1, you’re right in that a lot of the new weapons were still being tested out and therefore not used nearly as much as in the following world war. It feels like the existence of magic has had an effect on the technology in Tanya’s world though, so this may feel like a jump straight to WW2. Magic at least has placed an emphasis on air-based tactics that wouldn’t have been utilized otherwise. You bring a great point about the upbringing! I can’t imagine the MC’s personality surviving years and years of being treated as a child. We do get in the beginning the birth, then a couple of quick jumps to different ages. That really makes me believe there is a Tanya and a MC personalities. It could also be that Tanya is scared to go to war, and that’s why the MC personality has more dominance. As for the use of magic in battle, what we see in the beginning is that a) they have altitude limitations -> airplanes are more efficient and b) they have no firepower -> artillery is more effective. So, they mainly act as scouts/spotters, which is a really strong strategic advantage (as proven in the first battle where the rushing army gets mowed down by precision artillery courtesy of Tanya). The MC is really shaking things up.